1. In a small pot, cook gulaman over low heat based on package instructions. Add sugar then stir until dissolved. 2. Transfer into flat container and let it cool until set completely. Cut into small cubes. Set aside. 1. In a pot, boil water over medium heat then add tapioca pearls. 2. Keep stirring to avoid from sticking together until cooked and turns into transparent. 3. Remove from heat then rinse into running water. Drain and set aside, let it cool. 1. In a large container, combine all purpose cream and condensed milk then mix until well blended. 2. 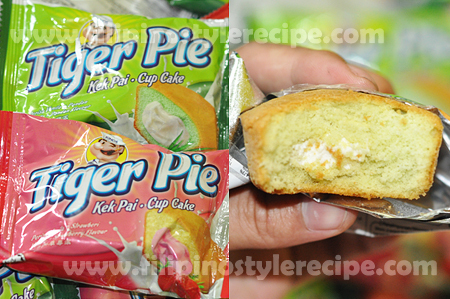 Add gulaman, coconut strips, nata de coco, sago and pandan flavoring essence then mix. 3. Cover and refrigerate for at least 6 hours or overnight before serving. 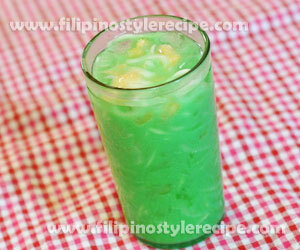 Filipino Style Recipe: Buko Pandan Drink is another refreshing beverage and usually serve during afternoon or summer season. This drink is consists of shredded coconut, pandan gelatin, milk and coconut water then stir with ice. 1. Prepare gelatin based on package instructions. Let it cool and cut into small cubes. Set aside. 2. Boil pandan leaves in 4 cups water over low heat for 20 minutes or until aroma comes out. Let it cool and set aside. 1. In a water pitcher, combine all the ingredients then mix well. 2. Serve with ice cubes. Enjoy! 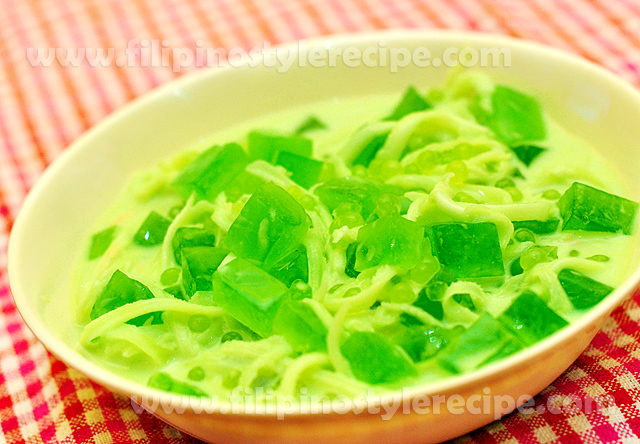 Filipino Style Recipe: Agar-Agar Salad is another popular appetizer or dessert of Filipinos that is commonly served in every special occasions like Christmas and New Year. 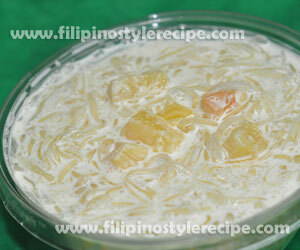 Salad is consist of gelatinous substance blend in condensed milk and cream together with various fruits. 1. In a pot, combine, agar-agar powder, flavoring extract and water then stir until dissolved. 2. Bring to boil over medium heat until slightly thicken. Keep stirring. 3. Pour the mixture into baking pan or rectangular-shaped container. Set aside and let it cool until solidify. 1. Scrape the agar-agar into strips. 2. In a large bowl, combine fruit cocktail, cream and condense milk then mix. 3. Cover and refrigerate for several hours. Serve cold. Filipino Style Recipe: strawberry milk gulaman is another refreshing beverage and usually serve during afternoon or summer season. 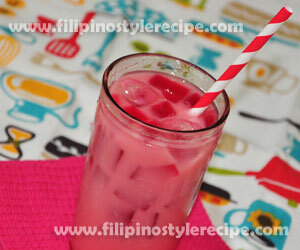 This drink is consists of strawberries, syrup, milk, sugar and gulaman then stir with ice. 1. In a square container, dissolved strawberry gelatin powder in boiling water then stir until completely dissolved. Let it cool and place in fridge until firm. 2. Cut into small cubes. Set aside. 1. In a blender, process strawberry, strawberry syrup, milk and sugar until smooth. 2. 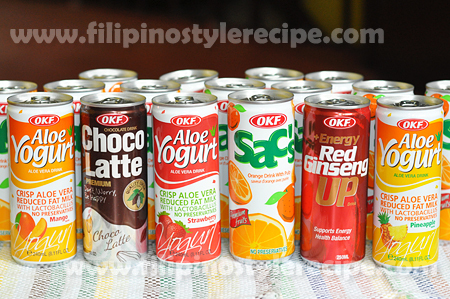 Pour in tall glasses then add strawberry gulaman and some ice. Serve. 1. You may garnish the drinks with fresh strawberry before serving. 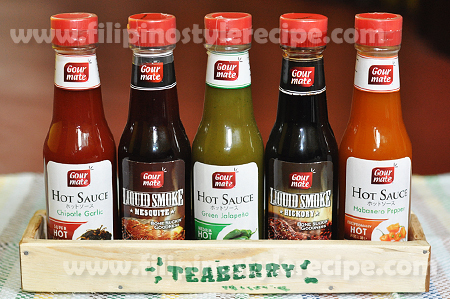 Filipino Style Recipe: sago at gulaman is a popular refreshing beverage and usually served during summer season. 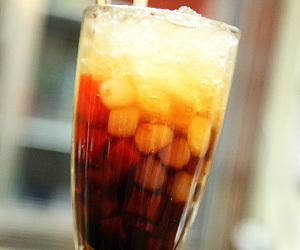 This refreshing drinks is made of tapioca pearls(sago), gelatin(gulaman), sugar syrup and crushed ice. 1. In a square pan, dissolved gelatin powder in boiling water then stir until completely dissolved. Let it cool and place in fridge until firm. 1. In a saucepan, boil water then dissolved brown sugar. Stir until dissolved then let it cool and set aside. 1. In a glass, place tapioca pearls and cubed gelatin. 2. Pour the syrup then top with crushed ice. Serve cold! 1. Soak tapioca pearls in water for 3 hours then cook in boiling water for 15 minutes or until turn clear.